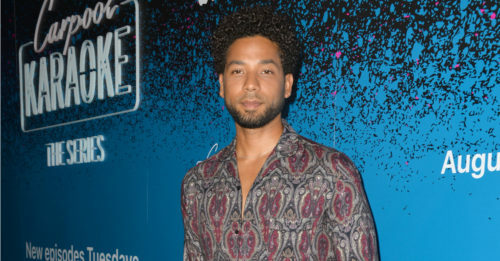 Jussie Smollett, an actor best known for his portrayal of gay musician Jamal Lyon on the hit TV show Empire, has been hospitalized after a racist, homophobic assault in Chicago last night. The actor reportedly went to a Subway restaurant near where he was staying around 2:00 a.m. when two men, both white and wearing ski masks, yelled at Smollett, saying, “Aren’t you that f*gg*t ‘Empire’ n*gg*r?” Both assailants then attacked Smollett. In the course of the fight, Smollett suffered a broken rib and many other contusions. They also poured a chemical substance, believed to be bleach, on the actor. Prior to the assailants leaving the scene, they wrapped a noose around Smollett’s neck. Several sources, including Smollett himself, have also reported that the assailants said, “This is MAGA country” during the attack. Smollett refused to be transported via ambulance, checking himself into Northwestern Hospital after the attack. He is listed in good condition. Smollett is a New Yorker, but resides in Chicago during the filming of Empire. Police are treating this as a possible hate crime and are seeking any eyewitnesses or video to help in their case. If you or anyone you know saw the crime, please consider contacting the police via (312) 747-8382 or www.cpdtip.com.